The Cleanup is a volunteer group led by the inspirational Matt Dell and fishing boat skipper Dave Wyatt. 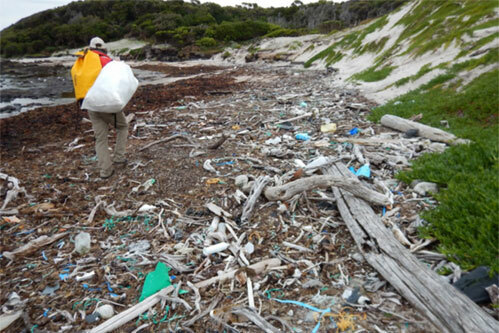 For more than a decade they have taken groups to one of the wildest and most inaccessible coastlines on Earth to witness and do something about the marine litter that is polluting the oceans and shorelines there. At Expedition Class we have shared these cleanup’s in real time through participant blogs. In early 2016 we went one step further. We’re embedding a teacher with the crew to write directly for a younger student audience and attached online lessons to go with it. That teacher was Pat Spiers. Pat was selected from teachers across Australia to report exclusively for school students and teachers during the expedition from 6th-13th March. Pat's normal job is at the Field of Mars Environmental Education Centre in Sydney and is a keen adventurer in his spare time. Pat wrote about, photographed and filmed the cleanup each day and the reports were updated live from the field. To do this we used a satellite connected device because there is no mobile phone connections from the remote areas in South West Tasmania. You can still use the learning pack to understand more about the goals of this voluntary effort and the much larger issue of marine litter. There are resources in the pack to make planning your own classroom cleanup a breeze. Keep an eye out in early 2017 because we have a major new project under development that will build on this work and offer even more opportunities for students to get informed and involved.